Home » news » New York Traffic—Will Every Day Become Like Labor Day? New York Traffic—Will Every Day Become Like Labor Day? Labor Day Weekend is well known as one of the busiest traffic periods of the year. With so many drivers escaping the urban jungle for a weekend at the beach, the lake, or the mountains, New York’s highways can sometimes seem more like parking lots. And according to a new study, if current trends continue, New York Highways might soon experience Labor Day-like traffic every day. The report, released by the U.S. Travel Association, analyzed highway data and growth rates along 16 key interstate corridors nationwide, including two in New York. It found that without investment and policy changes, average daily car congestion will soon surpass that of Labor Day Weekend. For the I-86 corridor between New York City and New York’s Finger Lakes, daily traffic is expected to reach current Labor Day levels by 2039. And for the I-95 corridor between New York and Washington, DC, daily traffic should reach Labor Day levels as soon as 2023! 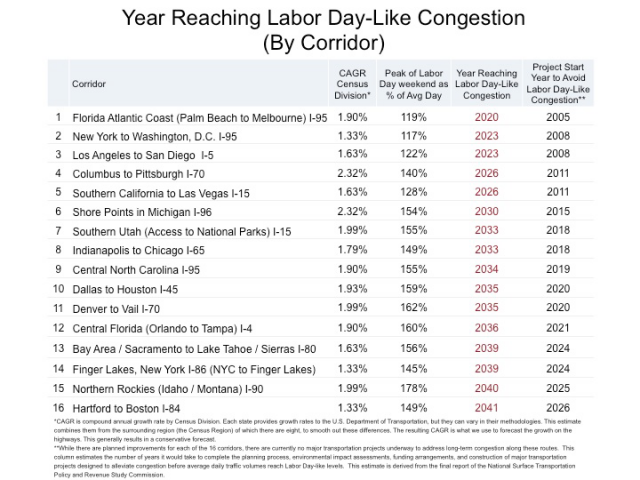 The chart below outlines the estimated year that various corridors would reach Labor Day-like congestion on a daily basis, according to the U.S. Travel Association.